hope will improve their sometimes tumultuous relationship. December 27, 2002 - SAN FRANCISCO, CA - About a half dozen friends of John Pavlat found a haunting e-mail on their computers sometime between Christmas night and this morning. The e-mail was an apparent suicide note. 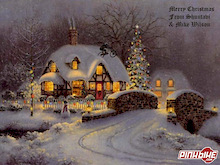 We hope Santa was good to all of you this Christmas. For 2003 may the trails be steep, crooked and gnarly. May your gaps be large your drops be long and your transitions be endless. All the best to you and yours this holiday season. Here's to an injury free year in 2003 - for all of us! 2003 Sea Otter Classic Registration now open. The 2003 Sea Otter Classic Online registration is now open. Don't wait, categories have tendency to fill in quickly! Ever had the chance to help fellow mountainbikers purchase the land on which they ride? What if that land were open to all mountainbikers and thanks to generous donations like yours, would remain so forever? The New England Mountain Bike Association is collecting donations to purchase a 47 acre parcel of land at the headwaters of the Upper Charles. Just $200,000 is needed by October 31, 2003 to buy this land and NEMBA is already $90,000 into the effort. Do your part, give what you can whether or not you're from the New England area. This is history in the making and could very well be a model for land access around the world. NEMBA has even thoughtfully put together a sweet video of the trails you'll be helping save. For another year, Big Mountain in Whitefish, Montana plays host to the Red Bull Freezride. In true Red Bull form, this is yet another of the most unique mountainbike events on the planet. 54 spots are available for qualifying and Red Bull is accepting applications from athletes interested in attending the event. Like last year, the course will be designed by Shaums March so you can be sure the snow will be piled high, the lines will be sick and you'll once again see the big red bus on the mountain. All film makers have high hopes for their projects and certainly we at KSK are no exception. "Red Light Go" is KSK's first long format program and was independently produced over a period of 2 years. While we all felt pretty good about the results of our efforts, it did come as a bit of a surprise when we got a last minute request to send a copy of "RLG" over to the Museum of Modern Art. It's been a while now when I've sent the latest news about myself. 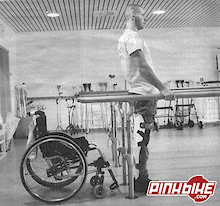 Some months have passed since my accident and a lot of people wanted to know how I was going. I am doing good, especially because I am back at home, yes I left the hospital about 10 days ago. It is great to sleep in my own bed, to see my friends and family more often than before and to simply be back in the 'normal life'. Nothing is really normal yet, because I actually face now what has really happened. Episode 4 - Rossland is currently online and available for download. Each episode will be put online for a limited time period so download it and save it to your computer instead of streaming. 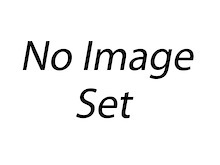 (RIGHT click on the link, and save target as)NOTE: If you are having a problem downloading on the same day that the video comes out it is due to the 1000s of users trying to do the same at this time. The video server connection can get saturated. DropIn is a new Freeride TV series that is playing on networks across Canada. It features a group of pro freeriders traveling across Alberta and BC hitting some of the best riding destinations. Thank you to all fellow riders that discovered some of the best riding experiences ever with Chuck and myself. From the big names of mountain biking to mind blowing terrain, not to mention the great food, kamloopsbikecamp.com has something for all level of riders. The pre-race camps paid off for all our riders preparing for the BC Cup and Canadians. Can I say, everyone in the adult freeride tours had the time of their lives. 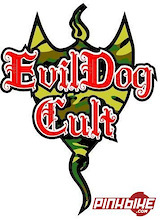 A mysterious new movment known as the Evil Dog Cult is currently sweeping the UK dirt jump scene and is receiving a lot of bemused interest from riders and spectators. A number of top UK dirt jumpers, including Luke Smith,Elbry Sandland and Jon Moss in the UK have been prominently sporting E-D-C stickers on their bikes and clothes. So what's it all about? Velovert.com officially announced that Nicolas Vouilloz signed a 3 year contract with Lapierre. The main goal of this partnership will be to develop Lapierre/Vouilloz specific products to be released in 2004. Mounted on Lapierre bikes, you will also be able to see Nico race many events throughout France. Velovert.com just announced that ten time world champion, Nicolas Vouilloz, is in the midst of signing a contract with some big name bike manufacturer. He will be the ambassador, competitor and part of the development for them (Free-Ride department). Will he be developing a new evolution of his "VProcess Spyke"? Keep an eye on Nico’s Site for an official press release. Also mentioned on Velovert.com is that ex-Maxxis racer, Fabien Barel, is still without a contract for next season. Numerous negotiations are going on, but none signed just yet. 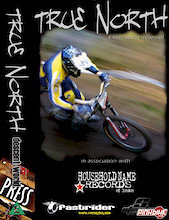 True North Movie Review. A film about downhill. I just recently was fortunate enough to get my hands on this new movie by jon_e Beckett called "True North" If I could describe this movie with only one word, it would have to be "Brilliant"!! 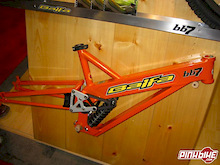 First shots of the production Ti Geared Inbred can be seen at www.singletrackworld.com. The bike has the same geometry as On-One's other bikes, but a lot lighter! You can read the singletrackworld.com feature on it RIGHT HERE. For more details you can also visit the On-One web site. The UCI BMX SUPERCROSS series will be held on specially designed BMX tracks, made only for the very top-level athletes of BMX racing. These downhill BMX tracks will feature obstacles, jumps and high speed that will bring BMX racing to another level. The pilot event will be held at Camp Woodward (Pennsylvania) USA, 19th to 20th September 2003. Camp Woodward is the premier BMX Freestyle facility in the world and the UCI BMX SUPERCROSS will be held on their very well known and respected downhill BMX track. Southerndownhill.com Mini Interview with Steve Peat. The Southern Downhill guys have managed to squeeze a few choice questions from Peaty!! here to read the interview. Enjoy! Word on the street is Whistler will be the July 18-20 western venue, and Nationals will be held in Fernie, but that has yet to be confirmed. After two successful seasons developing our downhill Race team here in the UK, we are pleased to announce that we have recently joined forces with Evolution imports and will be racing in 2003 as the “Yeti Europe Race Team”. Well this was a late one! The end of November and the weather was still great in the interior, everyone had the weekend off so what the &#*%? Lets go to Kelowna! We decided against our usual Thursday-Tuesday trip and voted for a quick renegade run to the beautiful Okanagan. Friday night we packed up and the four of us (Cro-Mag, The Count, Gord and Robb) headed west to the land of bliss and T&A. We drove through the night and ended up getting into town pretty late. Being late November we decided to retire the Casa de B-team (our massive 10 man tent) and opt for the luxury of a hotel room. Gord and Steve posed as lovers while Robb and I hid in the truck so we could get a cheaper rate, room #123 would be our home base. This Saturday, December 14th, Andrew Bicycle and Fitness brings Rider's Anonymous, Jib and Red Neck Riders to The Depot night club in Norfolk, Nebraska. Here's your chance to party with Mike Kinrade, Shawn Denny and Josh Bender who are making a special trip out for the weekend in honor of the event. This is an all ages event, cover charge is just $3. doors open at 7pm, movies start at 8pm. Drink specials, tons 'o swag and live music after the flicks. Johnny Waddell, back in action after a separated shoulder at the Red Bull Rampage, won the 3rd round of the Aussie national series with a time of 6min.45sec. Round 3 took place at the Thredbo ski resort on the infamous Cannondall run. Recently signed Giant rider Jared Rando took second. Tai Lee Muxlow, now back down under, beat out a strong women's field for the win. Well, well, well, what have we here? Another Superheros III premiere perhaps? This one's on Friday December 13 in Vancouver at Richards on Richards. Doors open at 7:00 pm and the movie will start promptly at 9:00pm. Tix are $10 at the door. The Who's Who of the Vancouver bike scene will be there. All the Rocky, Kona, Norco, Giant, Race Face guys will be there along with the Nation's top Freeriders (Brian O., Dave Watson, Wade Simmons, Andrew Shandro, and more). Like the poster says, there will be a live DJ, drink specials and tons of goodies to be given away. 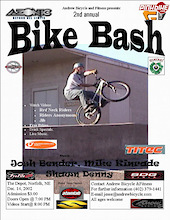 Take a break from the holiday madness to party with fellow riders and maybe pick up some swag in the process. Need Some Help Getting Through Another Monday Morning? Finding this morning a little rough after a weekend of Holiday shopping and need some sort of bike fix to get you through? Our good friends over at On-One bring you some much needed respite. If you're at work, you may want to put the headphones on, otherwise crank the volume and enjoy. The January 9th broadcast of Good Morning Miami, a prime time television show that follows Will and Grace on Monday nights, will star a Santa Cruz Blur. It turns out the show's producer, Bruce Alden, is no casual mountain biker. The guy really rides. Instead of having the bike hang on the wall (ala Seinfeld), Bruce wrote the Blur into the script. Advances tickets are $6.00 and can be purchased at Family Cyclery. Tickets at the door are $7.00. It's for all ages and there will some prizes!! Come in large numbers and join the fun! It's going to be off the hook! Team Planet-X is now accepting resumes for sponsorship through December 19th. As last year they will only accept resumes during that time any received after the deadline will be discounted. This year Team Planet-X will accept electronic resumes, but they must be written in a separate document and sent via e-mail. One bullit, two Bullits, three Bullits, FOR, five Bullits, six Bullits, RM7, more. That's a little rhyme that sums up how many Bullits I have seen this past summer. LOTS, and for good reason too! 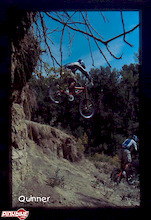 The Santa Cruz Bullit by my definition is the most well rounded, non-specific FS mountain bike this 2002 season. I've seen these bikes riding XC, dirt jumping, cliff hucking, trail riding, stunt riding, shore riding, racing DH, racing DS...even as a commuter in downtown Calgary. Hell, this bike does it all well. eBay auction page to make your bid. Allison Dunlap, 2001 World Cross-Country Champion and 2002 World Cup Champion, returns to Maxxis for the 2003 and 2004 seasons. How much do you spend each year having your bike maintained? Do you forego regular maintenance during peak season because you'd rather ride than dropping your bike off at your favorite shop for the better part of a week. Ever priced out a bike maintenance course? My guess is, we all spend well over $45 in a season having someone else make adjustments that we could easily take care of ourselves with a little instruction. As any rider who maintains their own bike will tell you, beyond the simple dollars and cents, there's something special about taking care of your personal ride. 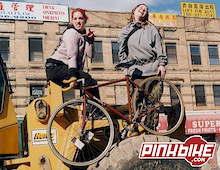 The ever growing masses of users that visit Pinkbike.com (now at 2 million hits per DAY) have finally made us bite the bullet and get some heavy server iron and lots of it. What you all will find especially useful is the huge increase in bandwidth and download quotas. until December 15th to apply. Email your resume or questions to sirbikealotracing@yahoo.com. 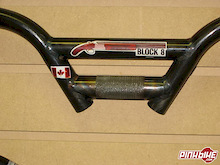 This bar was initially to be tested by Pinkbike's co-founder and code junkie, Radek Burkat. Its four piece 4130 cromoly (12 gauge steel) construction is built with some serious abuse in mind. Who better to thrash such a product than a 6'5", 265lb behemoth who has been known to bunnyhop park benches as a warmup? Unfortunately, right after we got this bar from the boys over at Revolution, Radek went under the knife for the third time after busting himself up at Calgary's Millenium park last November. That left us with the daunting task of finding a rider who could dish out Radek-sized abuse yet could still keep a thought long enough to put their impressions into words. Doug Fink of Bushido Tattoo fit most of those requirements, and as anyone who’s spent any time around Calgary’s dirtjump scene can attest to, Doug can certainly dish out some abuse (in addition to doing some bitchen skin art). Colorado Tops on IMBA Report Card - How did you Fare? Endless miles of high-altitude and desert singletrack, superb Rocky Mountain scenery, impeccably organized advocacy groups and abundant trail maps helped push Colorado to the top of the class in the 2002 International Mountain Bicycling Association's Mountain Bike Access Report Card with an A-minus grade. IMBA's Report Card is an annual assessment of the status of mountain biking in U.S. states, Canadian provinces and other countries. It was created three years ago to help IMBA manage the effectiveness of its efforts to preserve trail access for mountain bikers and create new opportunities where they are needed. 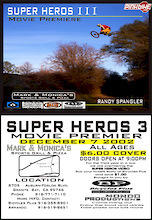 This Saturday, December 7th, Mark and Monica's Grill and Pizza at 8705 Auburn-Folsom Blvd in Granite Bay is hosting an all ages premiere of Superheros III. Tickets are just $6 at the door, or get yours early from Bicycles Plus and save a buck. Like all premieres, expect tons of prizes and great food and drink with the added bonus of an appearance by Randy Spangler. 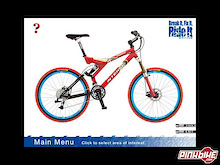 Contact Bicycles Plus at (916)355-8901 for more information. (Newbury Park, CA) - - Giant Bicycles, the leading global producer of performance bicycles, and Pearl Izumi, with over 50 years of setting the standard in performance apparel, have teamed up to create the Giant/Pearl Izumi Mountain Bike Team. With its November/December issue, 180 Magazine completes its first year with six solid issues. 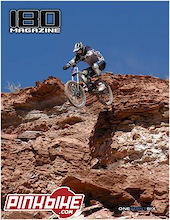 Issue ONEPOINTSIX features the first major print coverage of this year's Red Bull Rampage with the full scene report and even a rider's view of the finals by Norco's Mike Kinrade. Our Girls Rule feature spotlights the skills of the ladies, while our Ten Answers from the Street highlights the known and not so known riders who rip. Cedric Gracia won the St-leu Megavalanche race at Reunion Island this past weekend week-end with a time of 45min 28s. Anne Caroline Chausson finished 25th (1st woman) with a time of 52min 11s. As some of you might recall, Steve Peat was the winner of this race last year. Nicolas Vouilloz was missing from the lineup. He was racing the Rally du Var. For more info about the series, you can visit the Official Avalanche Cup web site. 2003 Chevy Trucks NORBA National Championship Mountain Bike Series. This new award came about partially because of the write-in campaign to get our winner on the ballot for the CC Awards! When we did launch the Readers Choice Award, over 30 different names were submitted, but the overwhelming favourite was downhiller Dustin Adams, who had a breakthrough year in 2002, finishing 4th at the Telluride World Cup (the first Canadian to make the DH World Cup podium in quite a few years), and third overall in the Norba DH standings. He was also the top North American man at the World championships, and repeated as national champion. Dustin's name appeared on 60% of the ballots, with national road champion Andrew Randell second (7%) and national cyclo-cross champion Roddi Lega third (5.5%). Episode 3 - Fernie is currently online and available for download. New Poll - Favorite Dropin Rider? 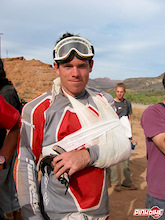 So the big question remains.....Who is your favorite Dropin TV show rider? This new poll is up on the main page, so cast your vote! The last poll was "What dually brand do you ride?" Over 43,000 votes were cast and the top 5 are Norco, Kona, Rocky Mountain, Santa Cruz and Specialized. Here are the poll results.